August has been a funny month; the weather seemed unsure of itself, sunny in patches, damp often and generally grey and cool. There’s a golden edge coming to the leaves already, and the people on the streets seem unsure of things: a man in a t-shirt, a girl in a mac, someone else walking past in a jumper and a heavy grey wool coat. Everyone is waiting for this tentative summer to end and Autumn to begin. Still, while the low, grey summer is a disappointment, I got the BHAG right back on track in August. Rather than relying on big rides to Westerham to bulk up my mileage, I decided to just put my head down and work. I cycled the commute route 19 times over the whole month – 12 miles each time – taking 228 miles out of the 2,011 total I need to cycle over the whole year. I even tried cycling in every day, home to work and back again, for a week. I realise this kind of regular riding needs a different kind of fitness to one long ride like London-to-Brighton. And it is a type of fitness I don’t have. By the Friday I am crushed, my legs aching as I walk up the stairs, knee clicking ominously. The bike is having problems too: the left crank keeps coming loose, and since it’s over a year since I bought it, I take it for a service. There’s a new bike shop round the corner from work – Fitzrovia Bicycles – and they do a great job. Riding home afterwards the bike feels great. In addition to the endless commuting, I manage 11 miles just beetling around the city on the Boris bikes – even though the system that seemed so charming in Montreal is, in London, somehow more frustrating and graceless. I cheered myself up by visiting the Rapha sample sale; it’s great stuff (and yes, the branding and design and all that is part of it), and even better when reduced to sensible prices. 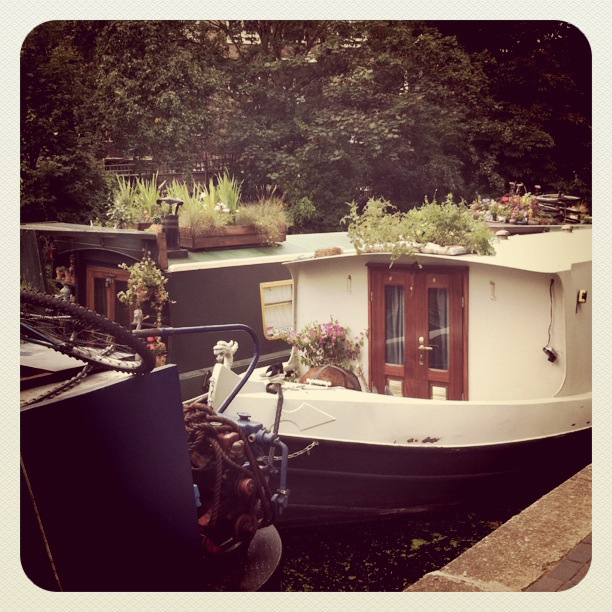 On the Bank Holiday, I finally cycle the Regents Canal as well. It’s an excellent discovery, and makes for a nice mid-range ride, shorter and more manageable than a trip out into Kent. I cycle through Charlton, then down from the top of Greenwich park to the foot tunnel, and round the Isle of Dogs towards Canary Wharf, picking up the canal near Westferry. Then it was a very pleasant cycle up through Hackney, past the moored boats at Victoria park and I stop for tea and cake at the Hackney Canal User Group pop-up cafe. I turn for home just before Islington, speeding down towards Barbican, over the river and back to waiting. Roll on September. This entry was posted in Cycling and tagged BHAG, cycling. Bookmark the permalink.